Theatres in St Petersburg are known to have existed since the time of Peter I, but it probably became the Russian Theatrical Capital only in the 19th century. Unarguably theatres in St Petersburg are an unmissable attraction in their own right, as they are very interesting from an historical and architectural point of view, and their remarkable theatrical and musical performances are really worth seeing. Today St Petersburg's vibrant theatre scene includes numerous major performance venues to keep you entertained and amused. Among them you can find the world famous Mariinsky Theatre, where you can watch the best Russian ballet and opera show; the Bolshoi Academic Drama Theatre, where you can see ground-breaking drama shows; and the beautiful Alexandrinsky or Mikhailovsky Theatre, where you can enjoy a mix of modern drama, musical shows, and classical ballet or opera. Of course there are other theatres and concert venues to go, or sport complexes where you can enjoy top performances from popular Russian musical shows to avant-garde experimental productions, along with opera, dance, comedy show, and everything in between, but the Russian theatres just mentioned are the top ones, and no one should miss it. For your information, St Petersburg's Theatre Season begins in early fall, with most theaters scheduling performances through mid September to late June, though the Autumn and Winter are the best times to seek out operas and ballets. You can find their repertoires and see their playbill at the ticket offices around the city or from the telephone-based city reservation service on 380-8050, or much better, by visiting their official website, from where you can now buy entrance tickets too. Find below our picking list of what we think are the best theatres in St Petersburg to go for the Russian Ballet, Opera, or Drama. Additional theatres might be added in the near future. For now enjoy the ones listed below. The Mariinsky Theatre is one of the world's most famous musical theatres in St Petersburg, and one of the oldest theatres in Russia. Opened in 1860, this is the place where a century ago the imperial Opera and Ballet was revealed to the world with "The Dying Swan" hosting the Great Anna Pavlova. Undoubtedly throughout the last two centuries the Mariinsky Theatre has been presenting the world with a plethora of great artists with top performances, such as "The Nutcracker" by Tchaikovsky, or the "Russian seasons" by Sergei Diaghilev. Best ballets and operas are on here, and they are combined with an impressive mix of historic architecture and state-of the art facilities that for many years has blown the mind of many visitors, including us. 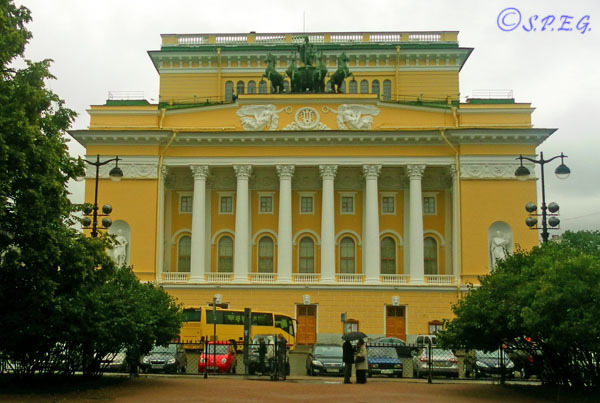 The Alexandrinsky Theatre is the best dram theatre in St Petersburg and the largest theatre in Europe. The theatre boasts not only a superb reputation for classical drama, but also a magnificent Neoclassical yellow and white building that is one of the undisputed architectural masterpieces of the Italian architect Carlo Rossi. Famous for a variety of drama, opera and ballet performances by the Imperial Theatre Companies, today it's one of the architectural jewels of the city, known more for drama than ballet. Centrally located this is a great alternative to the Mariinsky Theatre. The Mikhailovsky Theatre is another outstanding Neoclassical building not to be missed that rivals the famous Mariinsky theatre. Built in 1833 and named after Grand Prince Mikhail, brother of Nicholas I, the Mikhailovsky Theatre is the oldest opera and ballet houses in Russia, and it is very popular among locals for its repertoire of classic ballet and opera of the Soviet time, including other great international performances. The building is not so impressive from the outside, but inside you will be impressed by its luxury and decorative interior. The Hermitage Theatre is one of the oldest theatres in Saint Petersburg, and one of the most popular all over the world. 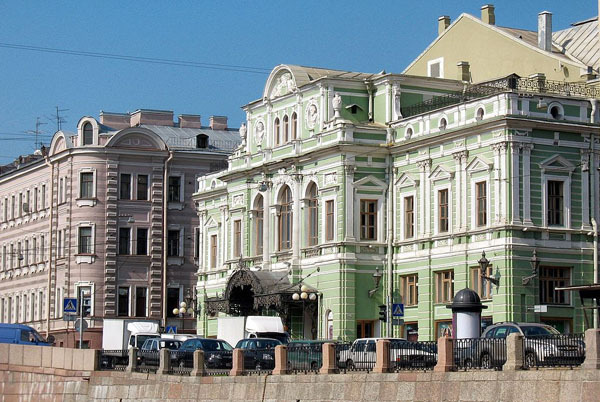 The Hermitage Theatre: one of the most popular small theatres in St Petersburg. Located at the eastern end of the Hermitage complex, across the Winter Channel near the Neva River, it was built as a private theatre for Catherine the Great by the Italian architect Giacomo Quarenghi between 1782-1787. Today the theatre houses outstanding interior decorations and its own historical orchestra, "St. Petersburg Camerata". Throughout the year the theatre hosts a whole range of amazing classical music and ballet performances, including international music festivals. This is the place to go in the summer months when the Mariinsky theatre is closed and many of its top performers can be seen here instead. The Bolshoi Drama Theatre is one of the most important Russian theatres in St Petersburg due to its history and artistic heritage, which is mostly related to the Soviet era. 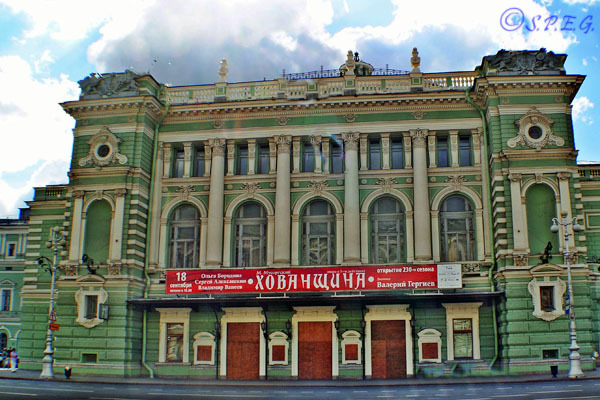 Founded in 1918 with the support of Maxim Gorki and Alexander Blok, the theatre was known in the past as the Maxim Gorki Bolshoi Dramatic Theatre until 1991, and then it was named after the prominent Georgy Tovstonogov, one of the leading of Russian Soviet. Today it has become one of the best theatres in the city performing classical plays and works of modern masters combined with amazing works of Russian literature. And, it has also become very popular worldwide because leading directors of Russian and world theatres cooperate with the theatre annually. 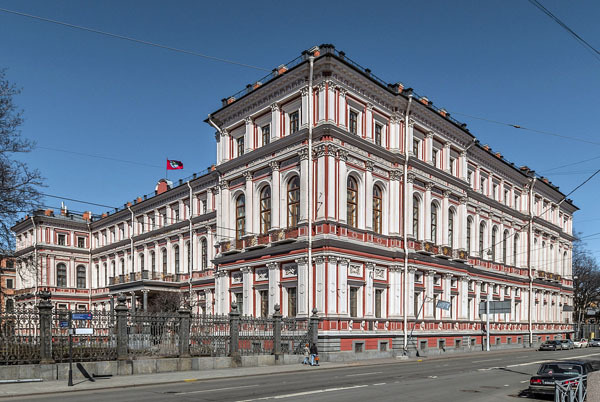 Located in the heart of the city, the beautiful Nikolaevsky Palace is the best place to go for any traveler who wants experience the history and cultural traditions of Russia. Being not a theatre, but definitely a place to see, here in the comfortable, elegant and restored Concert Hall of the Palace you can enjoy the famous Russian folk show "Feel Yourself Russian", while drinking wine and tasting Russian caviar. Designed by Andrey Schtaken Schtakensheider for the Grand Duke Nikolay, son of the Emperor Nikolay I, the palace is a great architectural masterpiece of the 19th-century, and interesting place to go. An evening spent at the Palace will be a pleasant experience for everyone, though entrance tickets are expensive. The St. Petersburg Philharmonia, the oldest Philharmonia in Russia, is more than two hundred years old. 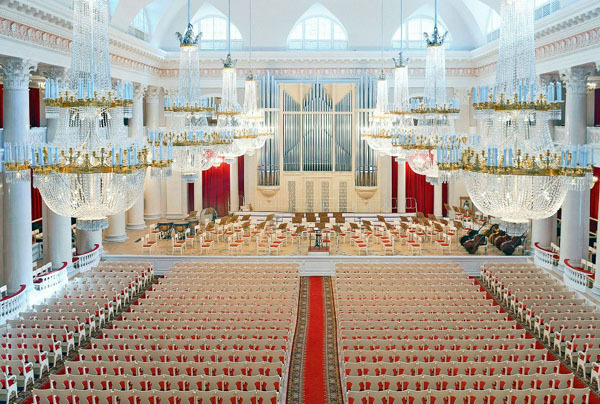 Its history goes back to 1802 when the St. Petersburg Philharmonic Society, the first one in Europe, was created. 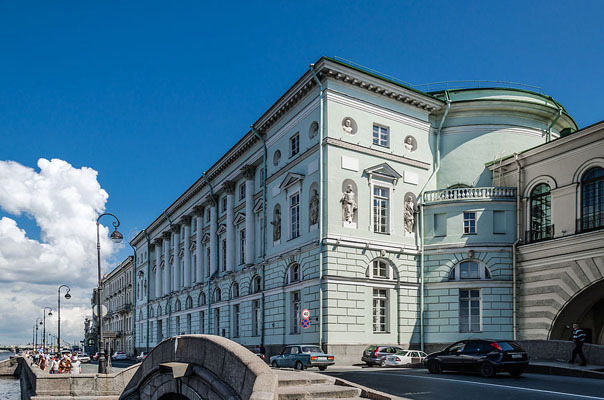 Built between 1834-1839 and designed by the Italian architect Carlo Rossi, the Shostakovich St. Petersburg Academic Philharmonia is an elegant Neoclassical building renowned worldwide for its excellent acoustics. The building was used to house "The Assembly of the Nobility", an organization of local administration in the 1861, while today it's home to the St Petersburg Philharmonic Orchestra, and since 1921 it hosts remarkable classical music performances and festivals which are attended by the major figures of the city, and Russia, including president Vladimir Putin. Even if you don't have the opportunity to attend a show while visiting St Petersburg, at least take a few moments to walk through the lobbies of some of these beauties. 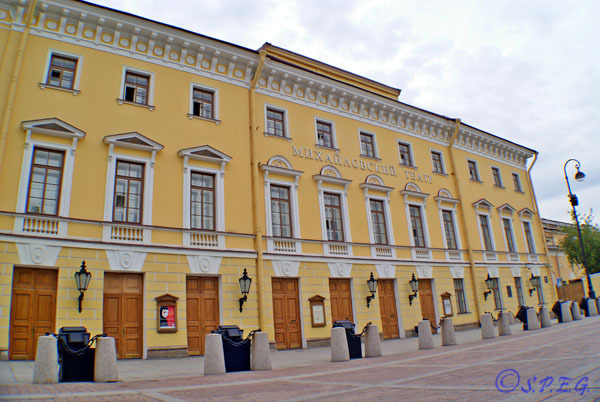 The new or old Mariinsky Theatre, the Mikhailovsky or Alexandrinsky Theatre, along with many others, are a really must-see for any visitor to the city. If you plan to attend a show at any of these theatres in St Petersburg, make sure you dress well. Although, there is no dress code and no one expects a tourist to dress formally, you may see evening gowns and tuxes next to jeans and sweatshirts, so I suggest that you wear neat, and properly fitted clean clothing. By dressing well, you're sure to be treated better, or at least thought to be more intelligent and interesting among others as you show respect for the community and environment. Please avoid shorts and t-shirts, especially if you go to the Mariinsky Theatre! Remember to buy tickets at least two weeks in advance before you go to any of these places. This way you're sure to find the best seats available, and perhaps even the best price. If you're looking to buy tickets, you can easily buy them on-line through the official website of each theatre's website. Just Google the name of the theatre you're planning to visit, and you should be able to find the respective website.